I’ve spent this week celebrating my 750th blog post by running a series of workshops around core topics: learning design, social leadership, culture and change. These have been great fun events: sharing, learning, making new friends and catching up with old ones. 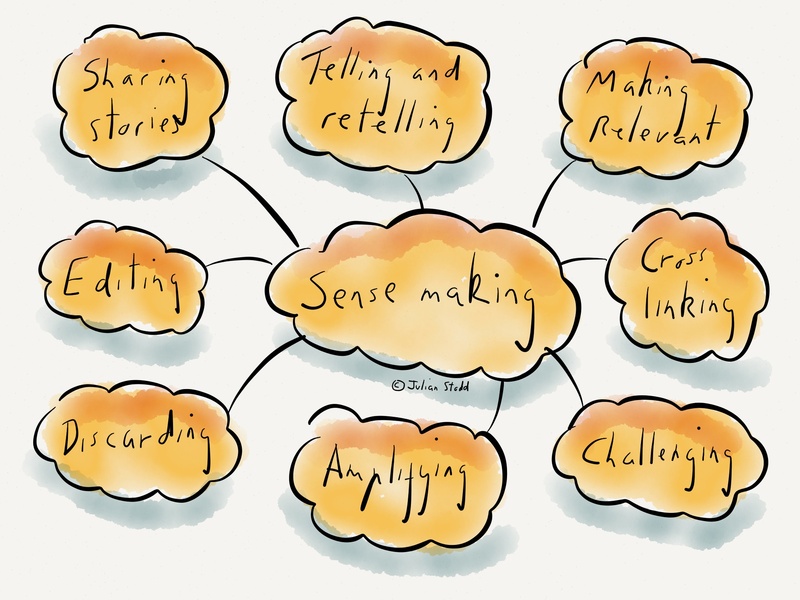 Today, i’m reflecting on the sense making and storytelling activities that we’ve been carrying out. These events have been about stories: our personal stories of how we came to be there, stories about the subjects we are discussing and, finally, a co-created story about our learning. Stories are powerful, engaging, compact ways of sharing complex information. It takes us time to get them right. So the ‘telling and retelling‘ element of events such as these are important. The stories i shared about social leadership are maturing, stories i’ve now told quite a few times: the story about culture and change is newer though, less well formed, it’s vocabulary and language still in need of tidying up. Retelling is an iterative process as we find the shape of the story. With every group, we have to make our stories relevant: to a particular audience at a particular time. Relevance and timeliness are some of the most important factors in engagement. Working within and alongside communities such as this lets us cross link: i have a long list of recommended research, books and articles, as well as introductions to new people as a result. I’ve been very luck to have some great feedback, both directly and in our wider community. Cedric wrote a blog post, working out loud, about his thinking around the workshop. This process of amplification and retelling of the stories makes them stronger. Some ideas fall by the wayside though: we have to listen to feedback in our communities, to discard some ideas and focus on others. Not all stories have legs. This editing and refinement process is a real strength of working out loud, within and alongside our communities. I feel lucky to have spent the week with such a strong and generous community. This entry was posted in Stories, Storytelling and tagged Challenge, Community, Sense Making, Social Leadership, Stories, storytelling. Bookmark the permalink.